Posted by letsdrinkon in At Your Service REWARDS, Baltimore, Baltimore Ravens, Bars, Dining - Restaurants, EAT. PLAY. LIVE., Foodies, Lawfully IMBIBE, Leisure, Lifestyle, Maryland, Preferred Partners, Signature Cocktails, Work. Life. Balance. Add fresh cucumber to shaker, with Green Chile Passion Fruit Syrup. Then muddle the cucumber and Green Chile Passion Fruit Syrup. Add the remaining the ingredients in the order listed above. Add ice to shaker and shake cocktail. Double strain the cocktail into a Coupe Glass. Birroteca has a unique location in an old industrial area of Baltimore called Clipper Mill. Known for its artisan pizza and Italian cuisine, it is worth the visit. Nick Ramey, who is in the video, uses the same creativity in his cocktails that he uses in ceramic arts. Nick has been in several videos already and is the creator of this delicious Signature Cocktail and many of the other cocktails you will find at Birroteca, as well as in other videos on the site. Like many of the bartenders we work with his knowledge of the different brands of alcohol and how they mix with other ingredients is extensive so you are pretty much guaranteed to get a great cocktail. This cocktail is a little sweet and tart from the Passion Fruit Syrup and the lime. The Elderflower Liqueur and Habanero Shrub give the cocktail a floral kick making it great cocktail for any evening with friends. Using a shaker with ice add the all of the ingredients except the Bella Bellini Lemonata Moscato. Add 2 sage leaves to the shaker. Garnish with a sage leaf and lemon twist. Birroteca is a cool restaurant in a unique location in an old industrial area of Baltimore called Clipper Mill. Birroteca is known for its artisan pizza and Italian cuisine – it is worth the visit. This signature cocktail is not a seasonal cocktail from the standpoint that you can enjoy it anytime of the year. Nick has once again worked his magic of perfect blends of herbs and alcohol. This signature cocktail has a nice balance of herbaceous gin and sage, with floral notes from the tonic and refreshing citrus. Nick Ramey, the creator of this cocktail is featured in the video. He uses the same creativity in his cocktails that he uses in ceramic arts. Nick has been in several videos already, so be sure try those cocktails as well. Like many of the bartenders we work with, his knowledge of the different brands of alcohol and how they mix with other ingredients is extensive so you are pretty much guaranteed to get a great cocktail every time. Fill highball glass with ice. Add the ingredient listed above to highball glass, except the rosemary sprig. Pour into shaker, and shake. Pour shaken cocktail back into highball glass. Kali’s Court is located in Fell’s Point of Baltimore, MD. Kali’s Court, once one of Baltimore’s premier seafood restaurants, has more recently become one of Baltimore’s newest and hottest night clubs. It is perfectly set for a couple of friends going out on the town and or a larger gathering. The layout has private areas for more intimate gatherings. Kali’s Court also has bottle service and VIP seating upstairs. They have kept their well-known outdoor seating area as well, which makes for a nice romantic setting during warm weather. This signature cocktail from Kali’s Court has an undertone of sweetness from the maple syrup that evens out the Maker’s Mark smokiness. The balanced cocktail is finished with a hint of lime. Carmen Motto is our wonderful bartender in this video. You have probably seen her in other videos of ours. She has been in the industry for years. She has shared her expertise here in Baltimore and down in Key West. Carmen is very energetic and entertaining behind the bar. You will never have a complaint if you are lucky enough to have her serve you. Muddle several lemon wedges in pint glass. Add the ingredients in the order listed above. Give the cocktail a good shake. The Point in Fells is located in the heart of Fell’s Point on Thames Street. It‘s across from the old stomping grounds of where “Homicide Life on the Streets” was filmed. The Point has great ambiance with its hard wood floors and old school wood bar and they have ample choices on their signature cocktail menu. There’s clearly something special about the place – on every visit they always have a crowd. It seems safe to say that, despite the vast array of drinking spots in Fell’s Point, The Point in Fells is the place to stop. Our lovely bartender in this video ,and creator of this cocktail, is Gala Bencivenni. Gala has been in the industry for the past nine years. However, she has been on the creative side of it for the past 6 years. Gala enjoys creating great cocktails for her customers to enjoy. She has been at The Point in Fells for four months as of this post. Gala is pretty entertaining and does know her way around the bar. When you make that trip to Baltimore, make that extra effort to get to Fell’s Point to visit The Point in Fells. 1.5 oz. of Blackwell Jamaican Rum. .5 oz. of lime juice. A couple of dashes of Angostura Bitters. Using a shaker add the ingredients in the order listed above. Add ice to the shaker and shake vigorously. Strain cocktail into rocks glass. Stephen Lamb has worked in the industry for about 10 years in Baltimore. During those ten years he has developed an acumen of what alcohol works well and pleases the palate. His cocktails tend toward a sweet flavor profile. The restaurant Verde is located in Canton in Baltimore City. Verde is a casual, upscale, full-service trattoria specializing in authentic Neapolitan pizza. Verde is developing a reputation for signature cocktails, so it is worth your time and effort to visit for both their food and the cocktails. This is Verde’s version of “Corn & Oil”. 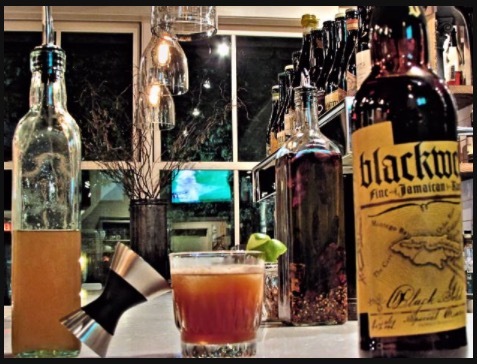 it is a lighter version, by substituting Dark Rum for Black Strap Rum and adding a small amount of lime juice. This signature cocktail is a boozy, yet balanced, spicy and complex cocktail. Plus- it’s one of those cocktails that can sneak up on you. Posted by letsdrinkon in At Your Service REWARDS, Baltimore, Baltimore Ravens, Bars, Dining - Restaurants, EAT. PLAY. LIVE., Foodies, Lawfully IMBIBE, Leisure, Let's Drink On, Lifestyle, Maryland, National Football League, NFL, Preferred Partners, Signature Cocktails, Work. Life. Balance. .5 oz. of fresh orange juice. .25 oz. of fresh lime juice. Dash of Bitter Truth Grapefruit Bitters. Dash of House Orange Bitters. Add all of the ingredients to a shaker in the order listed above. Shake all of the ingredients and double strain. Serve straight up in a cocktail glass. Garnish with flamed orange peel. The restaurant Verde is located in Canton in Baltimore City. Verde is a casual, upscale, full-service trattoria specializing in authentic Neapolitan pizza. Verde is developing a reputation for signature cocktails, so it is worth your time and effort to visit for their food and drinks as well. This cocktail has many ingredients and they are so well balanced that each one enhances the other. The pickled pepper juice and bitters have an interesting chemistry; first, the pepper juice leaves a little bite and then the taste of the bitters follows up. The taste of the bitters subdues the pepper juice. This cocktail is a very enjoyable cocktail for all seasons. Posted by letsdrinkon in At Your Service REWARDS, Baltimore, Baltimore Ravens, Bars, Dining - Restaurants, EAT. PLAY. LIVE., Lawfully IMBIBE, Leisure, Let's Drink On, Lifestyle, Maryland, Preferred Partners, Signature Cocktails, Work. Life. Balance. Add all of the ingredients listed above in the order listed to a shaker with ice. Shake and then strain into a cocktail glass. Stephen Lamb has been in the industry for 10 years in Baltimore. During those ten years he has developed an acumen of what alcohol works well and pleases the palate. His cocktails tend toward a sweet flavor profile. The restaurant Verde is located in Canton in Baltimore City. Verde is a casual, upscale, full service trattoria specializing in authentic neapolitan pizza. The “Sanguine Spice” is best described as a smooth and spicy cocktail, with hints of cloves and a tart finish. A great cocktail for New Year’s celebrations! Posted by letsdrinkon in At Your Service REWARDS, Baltimore, Baltimore Ravens, Bars, Dining - Restaurants, EAT. PLAY. LIVE., Foodies, Holiday, Lawfully IMBIBE, Leisure, Let's Drink On, Lifestyle, Maryland, Preferred Partners, Signature Cocktails, Work. Life. Balance. Add all ingredients except the cinnamon to a shaker with ice. Shake and pour into a Collins glass. Shave some cinnamon on the cocktail. Bread & Circuses is located in Towson, MD. Towson is the proud home of The Towson Tigers of Towson University. Towson University just received national recognition on American Ninja Warrior with Kacy Catanzaro, a graduate and former gymnast of Towson University. The upscale restaurant and bar is surrounded by establishments that cater to the Towson students so Bread & Circuses is a breath of fresh air in Towson, with the absence of chicken wings and mozzarella sticks in favor of more contemporary cuisine. 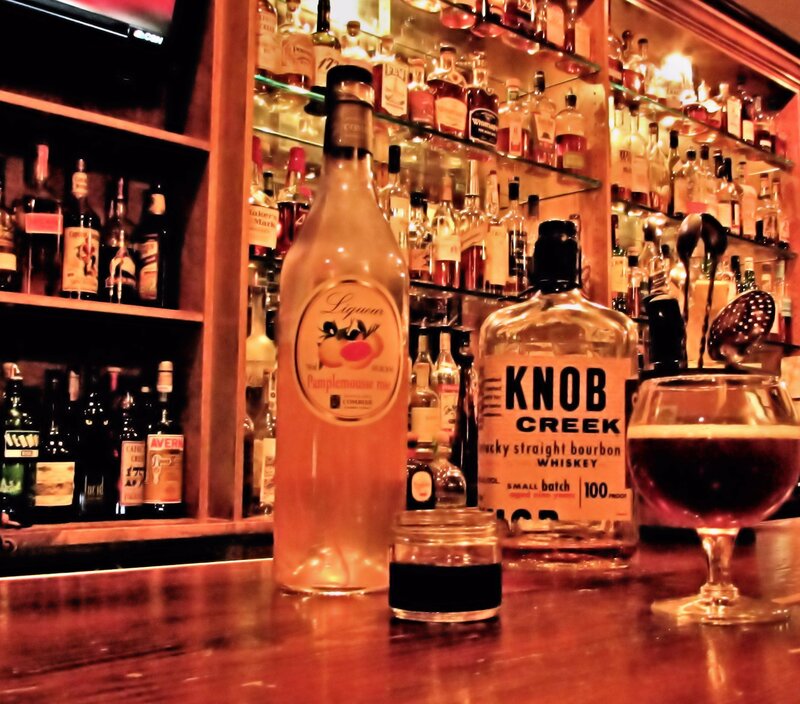 Bread & Circuses has an extensive list of signature cocktails and if you like Scotch, you this is the place to be. Victoria Oleyar is our bartender in this video. Victoria created this cocktail for us for the holidays. We think you will enjoy this cocktail as it fits the holidays well with the ingredients and taste. She is one of the many very knowledgeable bartenders at Bread & Circuses. 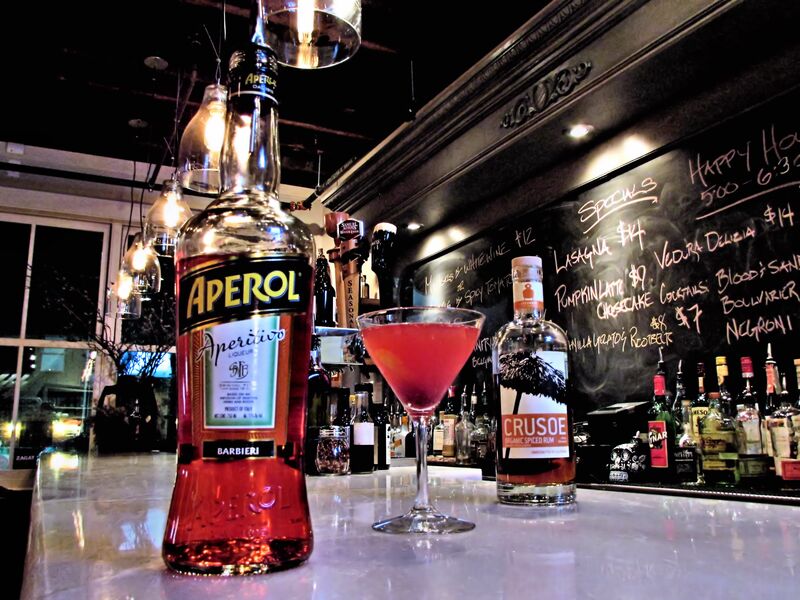 When you are in Towson, or even Baltimore, be sure to add Bread & Circuses to your list of restaurants to try, and have Victoria make you one of their signature cocktails. Posted by letsdrinkon in At Your Service REWARDS, Baltimore, Bars, Dining - Restaurants, EAT. PLAY. LIVE., Lawfully IMBIBE, Leisure, Let's Drink On, Lifestyle, Maryland, Party On, Preferred Partners, Signature Cocktails, Work. Life. Balance. Add the ingredients listed above in the order they are listed to shaker. The combination of flavors gives this drink depth, with spice from the marjoram and ginger melding with the grapefruit notes of the Pamplemousse and the bit of lemon, all balanced by the potent bourbon taste. This seasonal sip is perfect for winter, and is an exciting drink with bold character. 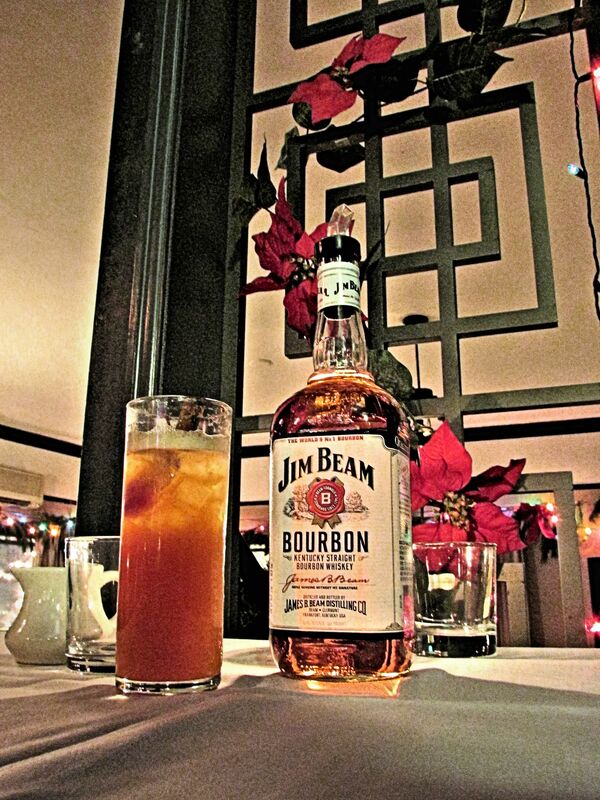 Even non bourbon drinkers love this drink. Blue Grass Tavern is located in Federal Hill, a nice neighborhood that is walking distance from the Inner Harbor. Apparently, this bar likes its Bourbon and Rye. The middle of the bar is filled with different Bourbons and Rye. So if you are like me and like your Bourbon, you will be in heaven. Don’t worry, though, if you are a gin or vodka person. There is plenty to choose from, and they support the local ones as well. Posted by letsdrinkon in At Your Service REWARDS, Baltimore, Baltimore Ravens, Bars, Dining - Restaurants, EAT. PLAY. LIVE., Lawfully IMBIBE, Leisure, Let's Drink On, Lifestyle, Maryland, Party On, Preferred Partners, Signature Cocktails, Work. Life. Balance. 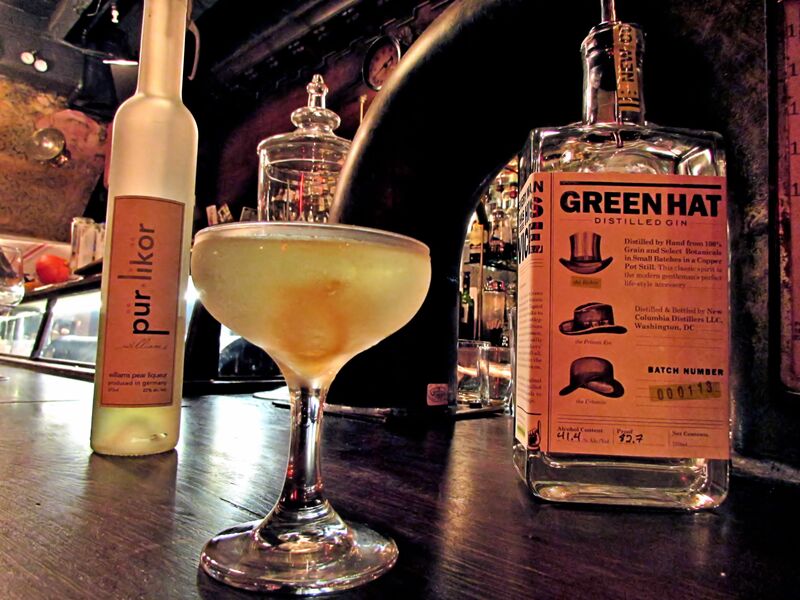 Add the Green Hat Gin, Pür Likör and Chocolate Bitters to strainer. Squeeze orange slice into shaker. This cocktail is created by Ian Clark of Fork and Wrench in Baltimore, MD. Ian has had several cocktails featured on our site so be sure to look those up as well. Ian is very creative behind the bar, very knowledgeable about alcohol, and his love of photography is demonstrated in how visually appealing his cocktails are.